Mostly, every organization issues a salary slip to their employees at the end of the month or whenever the salary is paid. 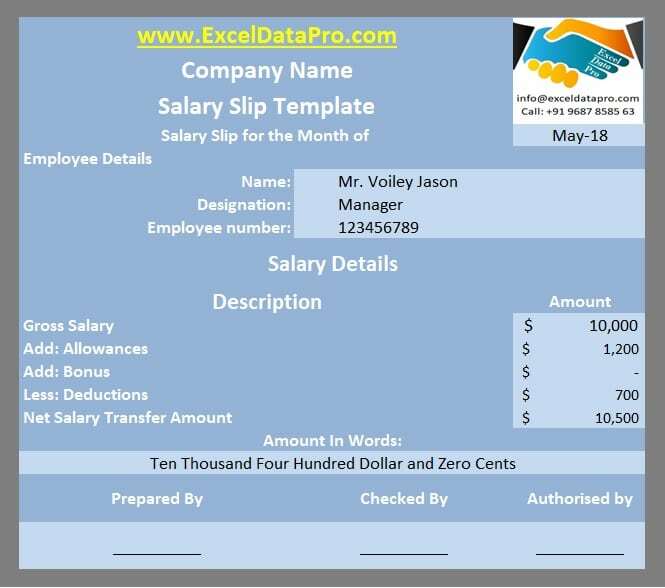 We have compiled top 9 ready-to-use Salary Slip Templates in excel. You can choose the one that best suits your requirement. 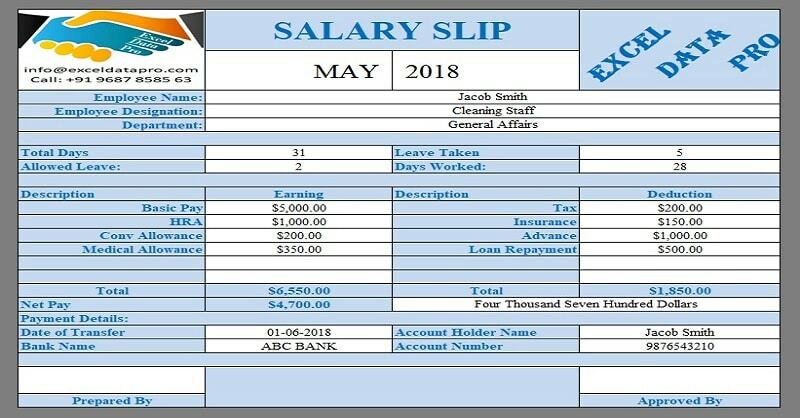 Salary Slip is a payroll document that contains details of salary paid to any employee which include basic salary, allowances, deductions, attendance, leave record etc. The salary slip is different for different for industry and organizations. Some companies pay in cash, some through cheque and some through direct bank transfers. We have created following 9 ready-to-use Salary Slip Templates with predefined formulas. You just need to enter the payroll data of your employees and print the salary slip. Lets us discuss each template in brief. Simple Salary Slip Template consists of basic details of employees like employee id, employee name, designation, date of joining, basic pay, allowances, deductions etc. When you enter the amounts it will automatically compute the Net Salary. This template can be useful to small companies where there are no provident fund or other detailed deductions. Click here to Download All HR & Payroll Excel Templates for Rs 199. 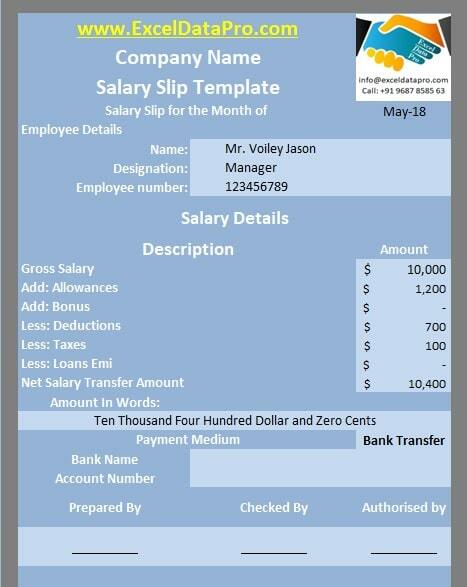 Corporate Salary Slip Template, as the name suggests is mostly used by big MNCs and corporates for employees salary. This template consists of detailed bifurcation of allowances, deductions, and other details. This templates is configured with pre-defined formulas and will automatically calculate the subtotals for gross salary, allowances, deduction and also calculate the final payable amount of the salary. 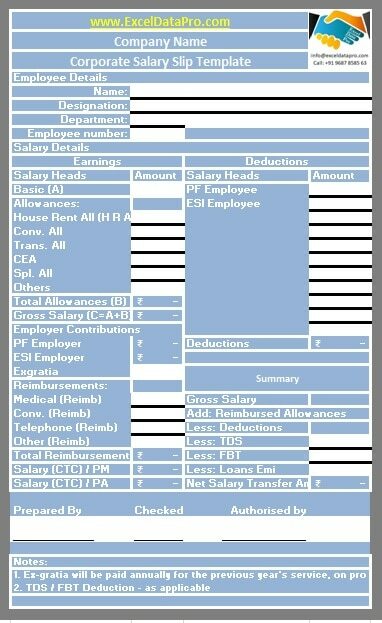 Salary Slip Template with Taxes consists of tax deduction apart from allowances, deduction, and other related items. This template can be useful for medium scale industries/organizations where tax is mandatory to be deducted at source. Similar to the above version this template doesn’t include taxes. All other items are same. This is useful to small industries for whom the TDS is not mandatory. The user just enters the amount and it will automatically calculate the totals. 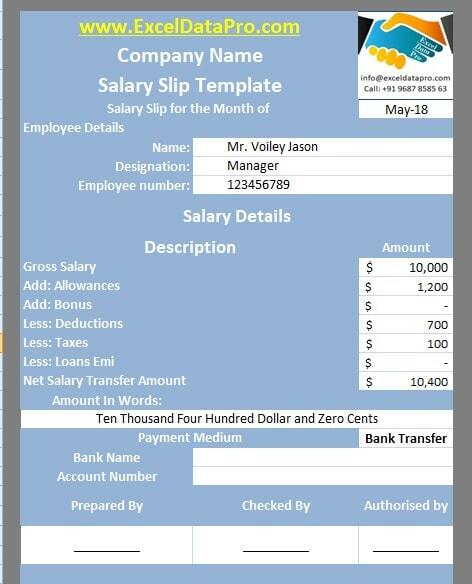 Salary Slip Template Without Bank Details is for those companies who provide salaries to their employees by cheque or in cash. It can be useful to office in small towns or small companies who have no more than 10 employees. 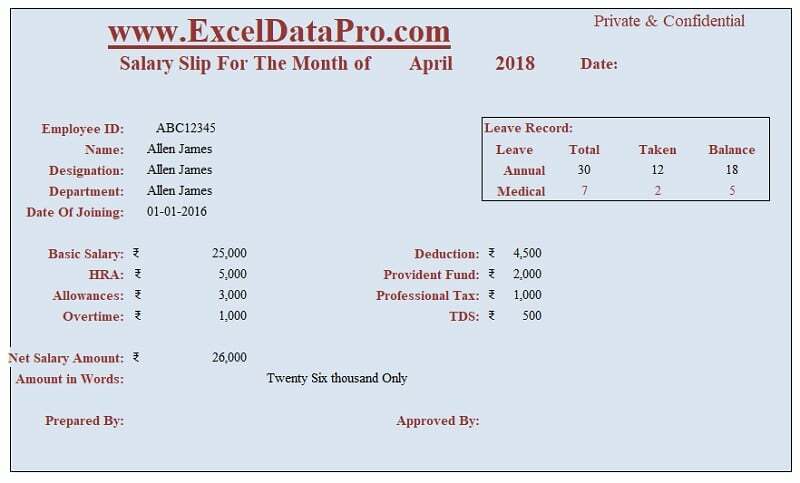 Salary Slip Template without bonus doesn’t consist of bonus salary pays. This template is for those companies who have no bonus salary policies. Though this type of companies is less. 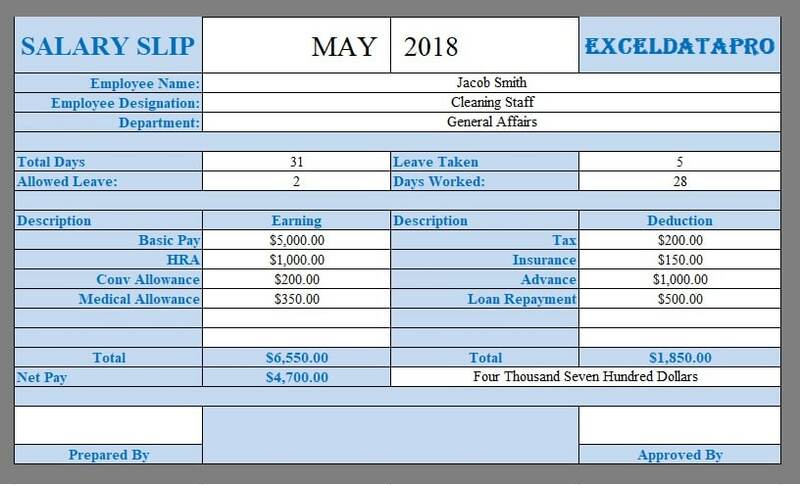 Salary Slip template with yearly bonus consists of additional space for the payroll assistant or accountants to enter the bonus pays a and when required. Though this type of salary slip is required once or twice a year. In India, employees usually get bonus pays on Diwali or Christmas depending on company policy. In the Middle East, this happens during Ramadan whereas in the west it is during Christmas. This Template is specifically for Indian organization, where the provident fund is mandatory. It includes automated Provident Fund calculation according to the government rules. If they change you need to make minor changes in the formulas. This template can be used by HR assistant, accountants of medium and large scale companies in India. 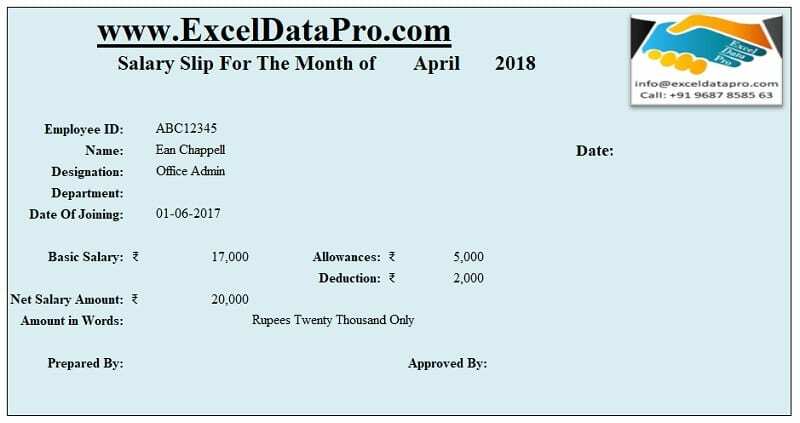 This template is similar to simple salary slip. It contains the allowances, provident funds, government taxes, TDS, overtime and also the yearly leave record of the employee. This can be used by all organization either it is small or big. Enter the amounts and it will automatically calculate the Net Salary Amount as it contains predefined formulas. You can also download other HR & Payroll Templates like Employee Resignation Schedule, Salary Sheet, Salary Slip, Job Candidate Tracker etc from here. We thank our readers for liking, sharing and following us on different social media platforms. If you have any queries please share in the comment section below. I will be more than happy to assist you. I love working in Excel and I share functional excel templates at ExcelDataPro. Read more about me here or interact with me on twitter. I need VBA code sheet for learn. VBA code for which file do you want. Bcoz none of this 9 template has any VBA content.